"The final Republican tax bill contains slightly more in tax relief for the middle class than did its earlier versions, but the wealthy remain the biggest winners in the plan, a nonpartisan tax analysis group concluded Monday," notes the Washington Post. 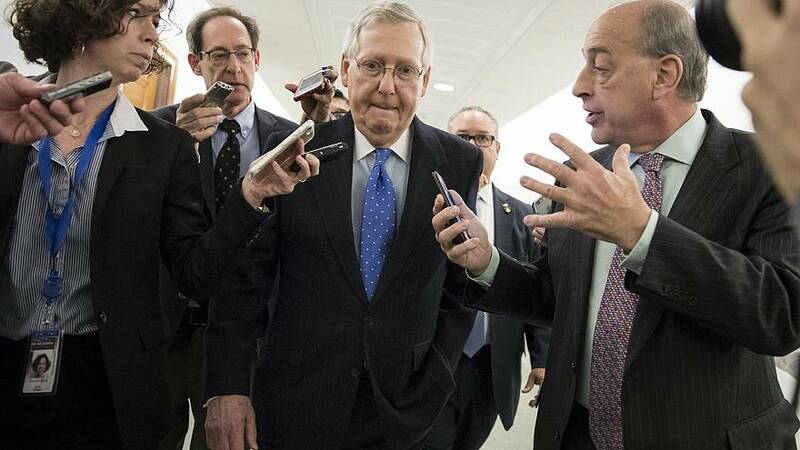 From NBC's Benjy Sarlin: "Sen. Orrin Hatch defended a late provision he added to the GOP tax bill that could extend significant tax breaks to real estate companies, among others. The controversy threw a spotlight on one of the bill's largest and most complicated tax provisions, one where even small tweaks can affect large swaths of the economy. The Utah Republican's statement came after a wave of speculation that the benefit had been added to secure a "yes" vote from Sen. Bob Corker, R-Tenn., a wealthy real estate investor who has strongly denied any role in crafting the provision. Hatch said it was a product of House and Senate negotiations and had nothing to do with Corker, who had been on the fence before announcing on Friday that he was backing the bill." Jonathan Allen notes how hard it may be to sell the tax plan. The Wall Street Journal: "The final tax bill offers much of what large companies hoped to gain from the Republican overhaul: the billboard corporate rate was knocked down, cuts were accelerated and key credits were preserved." Robert Pear in the New York Times has what you need to know about the tax bill's implications for health care after the elimination of the individual mandate. The new tax bill is going to make life very hard for an agency that Republicans have spent years criticizing: the IRS. And in POLITICO: "The Republican tax bill, largely written by lawmakers from rural and Southern red states, is about to squeeze urban America. The bill would eliminate tax breaks for everything from bike commute subsidies to building charter schools. One break for refinancing municipal bonds — which saved New York City alone $425 million over the past four years — would be gone. A key break for rehabbing old buildings is getting scaled back. At the same time, mayors and county executives are going to face pressure to cut taxes themselves. The $10,000 cap on state and local income and property tax deductions is by far the biggest blow for high-tax, high-cost-of-living, liberal big cities and their surroundings. The deduction was worth an average of $24,900 to New York County residents and $17,000 to those living in Marin County, Calif., across the bay from San Francisco, according to 2014 IRS data compiled by the Tax Foundation." Exclusive, from NBC's Ken Dilanian, Julia Ainsley and Carol Lee: "In the weeks after he became the Republican nominee on July 19, 2016, Donald Trump was warned that foreign adversaries, including Russia, would probably try to spy on and infiltrate his campaign, according to multiple government officials familiar with the matter. The warning came in the form of a high-level counterintelligence briefing by senior FBI officials, the officials said. A similar briefing was given to Hillary Clinton, they added. They said the briefings, which are commonly provided to presidential nominees, were designed to educate the candidates and their top aides about potential threats from foreign spies." The Washington Post: "White House lawyers are expected to meet with special counsel Robert S. Mueller III's office late this week seeking good news: that his sprawling investigation's focus on President Trump will soon end and their client will be cleared. But people familiar with the probe say that such assurances are unlikely and that the meeting could trigger a new, more contentious phase between the special counsel and a frustrated president, according to administration officials and advisers close to Trump." The Senate Intelligence Committee is investigating Jill Stein's campaign for possible collusion with Russians. Whoa. And there's this, from the Washington Post on Trump's frustration with Neil Gorsuch: "[E]arlier this year, Trump talked about rescinding Gorsuch's nomination, venting angrily to advisers after his Supreme Court pick was critical of the president's escalating attacks on the federal judiciary in private meetings with legislators. Trump, according to several people with knowledge of the discussions, was upset that Gorsuch had pointedly distanced himself from the president in a private February meeting with Sen. Richard Blumenthal (D-Conn.), telling the senator he found Trump's repeated attacks on the federal judiciary "disheartening" and "demoralizing." The president worried that Gorsuch would not be "loyal," one of the people said, and told aides that he was tempted to pull Gorsuch's nomination — and that he knew plenty of other judges who would want the job." Trump is pushing a long-delayed infrastructure plan. So where is it? Jane Timm takes a look. "Matthew Petersen, the judicial nominee who was widely ridiculed last week after a video went viral of him struggling to answer basic legal questions at his Senate confirmation hearing, withdrew from consideration on Monday." From NBC's Leigh Ann Caldwell: "The office that receives complaints from Congressional staffers on sexual harassment has refused to release information on settlements in the Senate, keeping secret the amount of taxpayer money spent to quiet such claims." AL-SEN: "Alabama Secretary of State John Merrill's office notified counties today that they must tabulate write-in votes in last Tuesday's special election for the U.S. Senate. The notification is one step in the process of certifying Tuesday's vote." NJ-GOV: "New Jersey Gov.-elect Phil Murphy is getting some pushback for posing for photos next to a cardboard cutout of Gov. Chris Christie lounging on a beach last summer." PA-7: ICYMI: "State Sen. Daylin Leach said Monday that he was "taking a step back" from his congressional campaign to deal with allegations from eight women and three men who said he had crossed the line with sexual talk and inappropriate touching. In a statement, the Montgomery County Democrat did not specify whether he was abandoning or suspending his bid for the party's nomination to challenge Republican Rep. Patrick Meehan, or merely seeking time to assess his next move."